Agent is eligible for $500 cash bonus for each Long Distance T-1. Agent is eligible for 125% cash bonus on Local SIP Trunks. Agent is eligible for 125% cash bonus of Port MRC for each LOCAL T-1. Agent is eligible for 125% cash bonus of Port MRC for each DS-1 DIA. Agent is eligible for 125% cash bonus for Private Lines. Agent is eligible for 300% cash bonus on Qwest DS-1 DIA with 2 year contract. Agent is eligible for 125% of Port MRC on all HIGH SPEED IP. LD T-1 must bill at least $800 in eligible usage on second bill (first full month of billing). Maximum available bonus per account is $5000, regardless of number or locations or multiple accounts. Eligible usage includes dedicated circuit 1+ and toll-free long distance calling excluding taxes, surcharges, monthly recurring charges, directory assistance, operator assisted or any other add on charges or fees. Maximum available LD T-1 bonus per account is $5000, regardless of number or locations or multiple child-accounts. Minimum one year term contract required for LD T-1 and two years term contract required for Local T-1/PRI. Promotion available to agents for new customers or new add-on circuits only. In order for the bonus to be issued to the agent, the customer must be current on all bills and have no delinquencies or bad debt and be in compliance with the terms of their contract for service. If customer cancels service, significantly reduces usage or is disconnected for non payment during or prior to the one year term, AireSpring reserves the right to charge back to agent as appropriate a pro-rated portion of the bonus previously issued. LD T-1s: If customer's average billing for the 2nd-12th month was less than $800, a pro-rated chargeback will be charged to agent's commissions. In order to qualify for promotion, customer contract must be received at AireSpring by 5:00pm PST on August 31st, 2008. Tiered rates do not qualify for bonus commissions. Cash bonuses are for New T-1s only. Renewals and moves qualify for bonus residual commissions and regular commissions only. Only credit approved and installed circuits are eligible. Standard retail pricing must be used. Any non-standard special pricing will not qualify for the bonus unless specifically stated in writing from AireSpring. 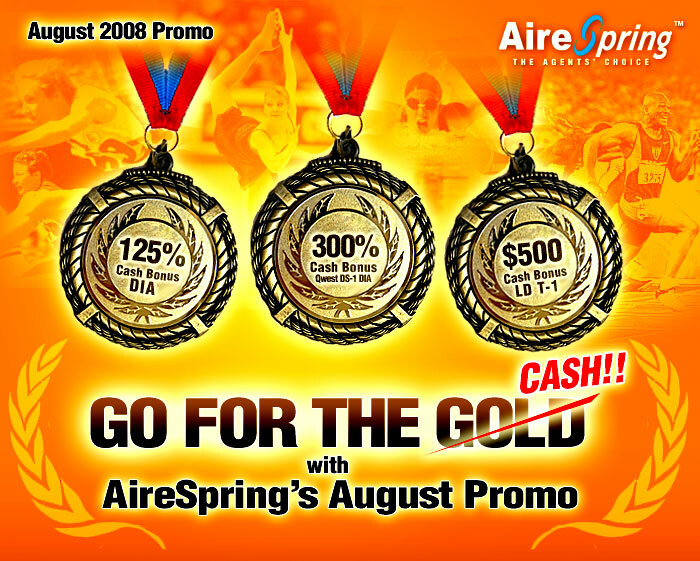 AireSpring reserves the right to verify that all orders conform to the intent and guidelines of this promotion. Agents have 7 days after the last month of the promotion period to change any order from last month’s promo to this month’s promo, to take advantage of higher commission bonuses, etc. However, if changing an order, all factors must match the new promo, including NRCs, etc. If the new month’s promo does not include a promotional NRC, then the order, if changed, would no longer be eligible for the promotional NRC from the prior month.